There is strong financial confidence linked to the central bank and its response to shifting economic dynamics and also in the government's commitment to fiscal surpluses. Goldman Sachs believes that Brazil could be one of the four leading economies in 2050, because of a growth of almost 140 per cent over the past five years, a huge territory (26 states and one federal district), vast population, economic stability and political certainty. Today, the Brazilian pharmaceutical market is third in America and ranks top in Latin America, with a 38 per cent share, compared with 21 per cent for Mexico and 16 per cent for Venezuela. Brazil also has a high happiness quotient and unites people from around the world through its annual carnival. Brazil will stage the 2014 World Cup and 2016 Olympics, both of which represent a strong growth in infrastructure investment ($200bn). In 1988, Brazil created the Sistema Único de Saúde (SUS), which guarantees healthcare for everybody under the terms its constitution. In 2007, the Sistema Unificado y Descentralizado de Salud (SUDS), the main agreement between the government and the states to implement the SUS, was created. The health system still shows inequalities between rich and poor. Specifically, many chronic and critical diseases such as diabetes, as well as many forms of cancer, go untreated due to a lack of preventative care. The SUS has more than 70,000 ambulatory units, 7,000 hospitals (private and public) and holds more than 400m consultations per year, including 100m with a specialist, seeing mostly chronic patients. The Agência Nacional de Saude Suplementar (the Brazilian agency that regulates health plans) estimated in 2008 that 28.6 per cent of the population used only the SUS, 61.5 per cent used a mixture and 8.7 per cent did not use the SUS at all. The private insurance market includes Supplementary Health (45m people) and Direct Payment System (DPS) (120m people). The richest 15 per cent of the population is responsible for over 40 per cent of medicine expenditure. Brazil's healthcare spending represents almost nine per cent of GDP and Swiss business network Osec calculates that demand for pharmaceutical products grows by 10 per cent a year. Almost 200m people – 20 per cent of the population – have private insurance. In 2010, pharmaceutical expenditure reached $20.95bn. In 2010, spending on healthcare reached $178.98bn, with an expected compound annual growth rate (CAGR) of 10.04 per cent by 2015, reaching $355.14bn in value at consumer prices. Government expenditure on health, which accounted for 46.4 per cent of total health expenditure in 2010, is forecast to increase in relative terms to 50.27 per cent of total healthcare spending by 2015. In September 2011, the government announced the funding of programmes that prevent, diagnose and treat cervical and breast cancer. Nearly $5.6m will be invested to manage both of these leading causes of death in Brazilian women. In February 2011, Health Minister Alexandre Padilha announced that medicines for hypertension and diabetes would be supplied free through a nationwide network of public pharmacies – Farmácia Popular – and also through private pharmacy chains that subscribe to the government's popular pharmacy programme. The popular pharmacy programme works with 1.5m patients every month, of which 700,000 have hypertension and 400,000 have diabetes. In Brazil, there are around 32m diagnosed cases of hypertension and approximately eight million cases of diabetes. These figures cover only the diagnosed patients; it is likely that there are actually 30-40 per cent more cases. While 80 per cent of patients rely on public healthcare for diagnosis, most pay for treatments from their own pocket. The Brazilian government finances 90 per cent of medicines to treat other conditions, including asthma, allergic rhinitis, Parkinson's disease and osteoporosis. This measure is part of a campaign to cut extreme poverty, as statistics show that the poorest of the population spend 12 per cent of their incomes on pharmaceuticals. The flagship programme is called PROFARMA, led by the Brazilian Development Bank (BNDES), with a budget of $1.5bn. Its main goal is to create a group of competitive pharmaceutical companies to reduce the country's big pharma trade deficit. PROFARMA represents the future of local pharma companies. In January 2009, the World Bank approved a $235m loan to Brazil's Health Network Formation and Quality Improvement Project (QualiSUS). It focuses on improving healthcare services provided by SUS, delivering systems for the prevention, diagnosis and treatment of priority health conditions, with an emphasis on non-communicable diseases. The estimated cost of the project is $677m. The continued growth of the Brazilian economy has made private healthcare (DPS) more affordable. The pricing system is faced with two conflicting forces. On one side, the goverment is trying to keep prices low in a bid to provide unrestricted healthcare, while on the other is an industry that wants higher prices to increase its profit levels. In October 2003, a new agency was created – CMED – charged with setting retail drug prices and another consumer price index was created: the productivity factor. The agency adopted a reference pricing system of sorts, which formulates its estimates on an 'adequate price coefficient' based on each drug in a basket of nine Western countries and the product's country of origin. Brazil has a basic reimbursement system, restricted to the public sector, reflecting the market's developing nature and traditional heritage of private provision. The public healthcare system is limited to medicines on the National List of Essential Drugs (RENAME). Government purchases and reimbursement of so-called 'high-priced medicines' in 2007 were reportedly budgeted at $700m. Total state spending and reimbursement of medicines stood at 12.3 per cent of the total central healthcare budget, with around 70 per cent spent on imported products. Brazil directly reimburses medicines used in the Single Health System (SUS) state hospitals for inpatients, as well as for essential and 'exceptional' medicines for outpatients in targeted disease groups, including HIV/AIDS, cancer, diabetes and less common conditions such as Chagas disease and endometriosis, covering around 400,000 people. In April 2008, a further 225 types of pharmaceutical ingredients were exempted from PIS and COFINS (federal taxes). In July 2010, the Commission for Social Security and Family approved proposals for new legislation exempting drugs for the treatment of diabetes and hypertension from all federal taxes. Around 51 million people suffer from these diseases in Brazil. The Brazilian government and pharmaceutical industry have resumed negotiations over reducing ICMS (Brazilian sales tax) rates. According to calculations by the Brazilian Institute of Tax Planning, ICMS accounts for 17.5 of the total 35.7 per cent average tax currently added to medicine prices. Non-communicable chronic diseases were the primary cause of 67 per cent of all deaths in the country in 2007. Cardiovascular diseases, chronic respiratory diseases, cancer and diabetes were the main causes, accounting for a total of 705,500 deaths. The need for anti-depressants is increasing rapidly in emerging markets, including Brazil, where the prevalence of DSM-IV major depressive episodes was 10.4 per cent in a 12-month period. The rapid economic development of Brazil has led to considerable transformations in epidemiological trends. The government is increasing its efforts to reduce mortality rates and prevent an epidemic of chronic non-communicable diseases, mainly through investment in education and prevention. This means there are considerable growth opportunities in the market for chronic disease medicines and diagnostics. Brazil is ranked top of the pharmaceutical markets in Latin America and third in North America, with a market value of $25.60bn in 2011. 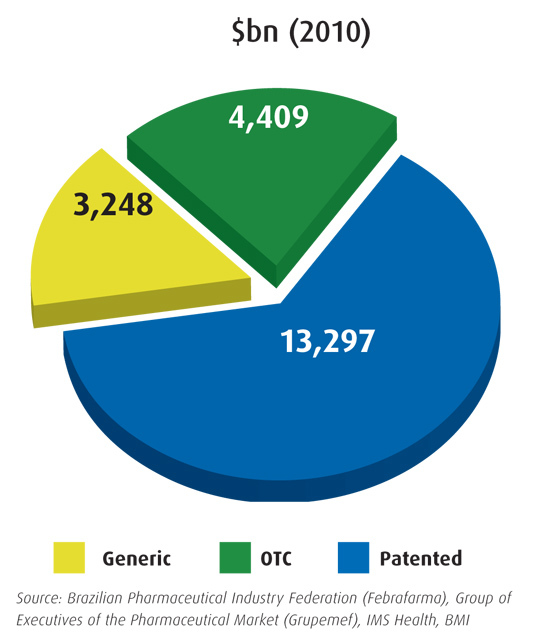 As happens in other markets, the rise of generics could erode growth of patented medicines. 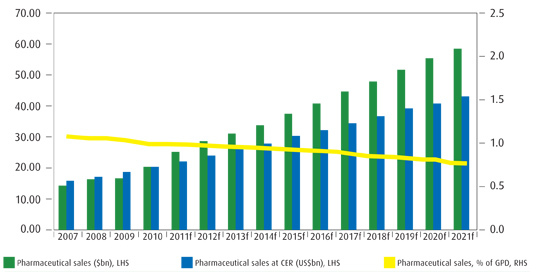 Between 2010 and 2015 the Brazilian pharmaceutical market has a predicted CAGR of 7.85 per cent and 10.25 per cent, in local currency and US dollar terms, respectively. The US is the leading source of imports, accounting for 22.6 per cent in 2010. Western European countries made up a further 44.2 per cent of imports. Brazil has passed a law to reduce the import of goods – including pharmaceuticals – produced outside Mercosur (the common market of Brazil, Argentina, Paraguay and Uruguay). Mercosur markets will benefit because, even if their prices exceed those offered by foreign firms by up to 25 per cent, they will be chosen as providers. To be included in the basic pharma products list, they have to be launched previously in other countries (branded – OTC or generics). This basic list is updated every two years, as is the case with the exceptional list, which includes rare, niche and highcost treatments. The products on the basic list are more likely to be generics, while those on the exceptional list usually come from technology transfer deals. A new raft of restrictive rules on advertising has been introduced. These affect the communication of safety/product information, requiring that television and radio adverts verbalise such warnings, while text sizes for warnings must be at least 35 per cent of the size of the largest font used in an advert. Television commercials for medicines can only be broadcast when children or adolescents are not likely to be watching. Samples of over-the-counter (OTC) medicines cannot be offered. In the case of antibiotics or oral contraceptives, samples are allowed only if they offer a full treatment period. In medical education, the rules state that if a company wishes to offer an unrestricted academic sponsorship, it must submit the agenda and content to the national health surveillance agency Agência Nacional de Vigilância Sanitária (ANVISA) at least three months before the meeting. Pictures of people ingesting products are prohibited and the use of celebrities is heavily restricted. To apply for OTC status, a drug must demostrate that it has been available OTC for a minimum of five years in the US or Europe. The OTC product must exhibit a mandatory red stripe on its packaging. All registered drugs are officially limited to pharmacy sale, although some supermarkets sell a limited number of OTCs. The best growth areas in recent years include topical painkillers, vitamin supplements, oral hygiene and appetite stimulants. Brazil's central government remains a primary sponsor of research, seeking to increase the country's drug development and medical research capacity, foster its domestic industry and reduce the current trade deficit. In September 2011, the Ministry of Health announced it would invest $881m in the research and development (R&D) sector by the end of 2014. The funds are to be allocated to 'neglected diseases' such as dengue fever, malaria and tuberculosis. In addition to increasing its R&D commitments, the government has promised to introduce two new clinical trial programmes. A law approved in November 2005 provides incentives for innovative private sector companies, with firms offered a 50 per cent reduction on the Industrialised Products tax on inputs for R&D, as well as a zero-rate exemption for all costs relating to the protection of intellectual property rights outside Brazil. The biotechnology industry is experiencing faster growth and offering a number of opportunities for international players. Guided by the desire to develop a world-class biotechnology sector, Brazil's government has pushed through a series of science and education reforms designed not only to establish national R&D centres, but also to develop the skilled labour to staff them. Over the course of 2010, eight national laboratories were given public funding to develop stem cell research projects. Despite the fact that prescriptions for biomedicines are rising in Brazil and that more and more Brazilian companies want to become international drug innovators rather than regional drug producers, a wary public suggests that biotechnology has a long way to go before being broadly accepted. However, Brazil's imports of medicinal biologics rose to $1,589m in 2009. Despite the expansion of multinational drugmakers in the country, 10 out of the largest 21 pharmaceutical companies are Brazilian, highlighting strong competition from domestic generic drugmakers. There are some 550 pharmaceutical firms in the country, employing around 23,000 staff and meeting the bulk of demand in unit terms. Of the top 10 firms by sales in 2009, the first four are all foreign multinationals. Pfizer, Novartis and Sanofi are clear leaders, followed by Roche, the Brazilian generics firm Medley (recently acquired by Sanofi), AstraZeneca (AZ) and Eli Lilly. In 2008, the median return on investment percentage figures stood at 9.1 per cent. Companies that achieved double-digit percentage returns included AZ (31.4 per cent), Biolab Sanus Farmacêutica (22.6 per cent), Neo Química (14.3 per cent), Bristol-Myers Squibb (11.2 per cent) and Roche (10.2 per cent). 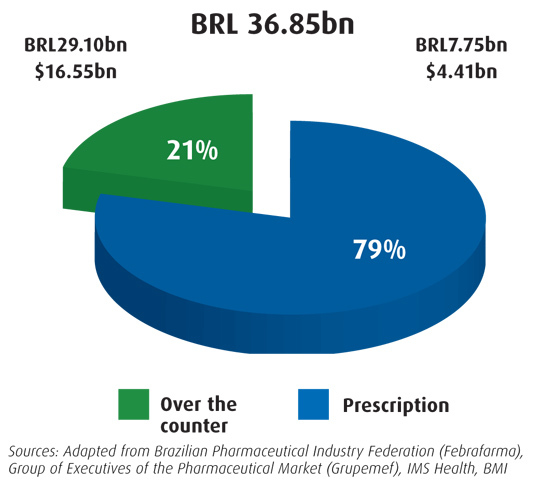 The large concentration of pharmaceutical manufacturing in Brazil is mainly attributed to strong domestic demand, particularly for manufacturers of generics. The market share of the domestic manufacturing sector is strong, being estimated at 70 per cent in generics, with local firms dominant in terms of volume growth. Brazil's generics market is the biggest in Latin America, valued at $3.25bn in 2010, and has been the fastest-growing drug sector since 2000: almost 25 per cent of medicines sold in Brazil in 2011 were generics. Its generic drug market grew by 24.8 per cent in real terms during 2010, marking another year of rapid market share gains for the industry. While doctors continue to resist prescribing generic medicines (44 per cent of them believe they are more susceptible to counterfeiting than patented medicines and 46 per cent are dissatisfied with Brazilian bioequivalence standards), most of the patients – almost 80 per cent – have confidence in them, which is not a surprise because they already pay for patented products. The increasingly regulated pharmacy retail environment means that pharmacists have greater influence over dispensed drugs and pricing has a greater effect on the consumer's choice of drug. Retail outlets are required to stock around 70 per cent of all generic products on the national list and to make appropriate information on the drugs available to consumers. Since 2002, the government has permitted, but not mandated, generic substitution by pharmacists filing prescriptions under Regulation 135/3. More importantly, doctors are required to use the active pharmaceutical ingredient (API) or international non-proprietary name (INN) of the drug when writing prescriptions. Bioequivalent generic drugs represent a fast-growing sector; by value, they account for 20 per cent of total prescription drug sales, or 15.5 per cent of total drug expenditure. Counterfeit drugs coming from Paraguay are still a major problem in Brazil. According to ANVISA, 20 per cent of medicines sold in Brazil are counterfeits. However, that percentage is one of the lowest in Latin America, compared with Argentina, Colombia and Mexico, which have more than 40 per cent, according to the US Food and Drug Administration (FDA). There are a lot of possible causes for the constant presence of fake medicines in Brazil. These include a weak goverment structure to monitor imports, corruption and a low staffing budget for ANVISA. ANVISA controls the registration of medical devices, requiring companies to establish a local office or factory, or a local distributor in order to access the market. ANVISA has its own regulatory standards; international certification is not accepted without the agency's quality assurance inspections. Approval of medical devices could become subject to greater risk-based differentials, if two proposals from ANVISA are implemented. Under these new measures, a fourtier system could be introduced, similar to the system used in the EU, in which low-risk health products are allowed easier access to market, while higher-risk products require suitable good manufacturing practice (GMP) certification. Proposed legislation would allow low-risk health products, in classes I and II, more simplified market access by streamlining the approvals process and making product information requirements more suited to the technical nature of a product. The new registration would be valid for five years. In vitro diagnostic products would be exempt from the simplified procedure. Registration for equipment and materials classified in higher risk groups III and IV would require GMP certification. For in vitro diagnostic products, this would apply to groups II, III and IIIa. Examples of products in these groups are magnetic resonance imaging equipment, orthopaedic implants and glucose self-testing devices. The registration process is already relatively swift, taking an average of 10 months. Product registrations are valid for five years and classified according to Law 9.782/99, which divides medical devices into three risk classes (1, 2 and 3). The cost of registration of a device varies according to the annual revenue of the company and is generally in the range $1,187-$11,877. The private sector accounts for the majority of medical device sales in Brazil (68 per cent), followed by the public sector (21.5 per cent) and exports (8.8 per cent). 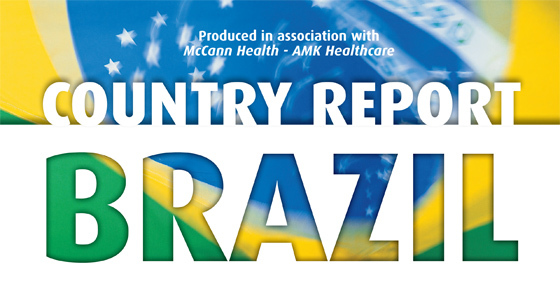 As the focus on healthcare continues to grow, so too do the fortunes of the main worldwide agencies based in Brazil. With an investment of nearly $100m, the number of professionals specialising in health and pharma (physicians, engineers, editors, app developers) is rising. There are now more than 140 healthcare agencies focusing on this field, about 100 of which are small agencies. Against a background of tighter regulation, collaboration among pharma and healthcare agencies has increased. There are a lot of new services, including digital channels, plus close scrutiny of certification procedures for campaigns, medical writing and so on. Also, there is an increased collaboration in the digital arena because of complex and incomplete government regulations. At the same time, there are more programmes being developed to improve patients' adherence to drugs, promoting better consumer loyalty, even in mass markets. With niche or high priced drugs, such programmes are essential. Brazilian pharmaceutical companies spend almost $700m annually promoting their products. The investment in sampling, details, journals and gifts is going down, while at the same time investment in digital, mobile and adherence strategies is increasing. Medical education investment is expected to grow, because the agencies are changing and looking for more return on investment (ROI). Physicians say that they need to understand all the key features of the products, so that they can improve patients' quality of life ultimately. Medical education programmes aimed at key opinion leaders (KOL) are really expanding the reach of impact, and KOL speaker tours reinforce the main marketing campaigns in Brazil. Unlike the situation in the US, direct-to-consumer (DTC) advertising of prescription drugs is illegal, with only dermocosmetics, OTC and phytotherapeutic products able to use this method. Brazil is experiencing new challenges as well as opportunities for increasing profitability. Pharmaceutical companies have to adopt an aggressive medical education approach and new communication technologies (digital media) alongside their conventional salesforce of medical representatives if they want better ROI. As there are likely to be fewer blockbuster drugs in future, multichannel marketing strategies, using digital media, which is cheaper, can bring the pharmaceutical companies greater ROI. Brazil has almost 76 million people connected to the internet, equivalent to 37.4 per cent of the population. In addition, doctors' behaviour is changing quickly. Doctors are busier seeing increasing number of patients, so they have little time to see medical representatives and they are more inclined to obtain the relevant information online. So pharmaceutical companies need to build their marketing strategies around digital media. KOL platforms, webcasts, online marketing, blogs, social media, forums, chat rooms and any other such media can be effective means to present the company's products and offers through opinion leaders. The digital world cannot be ignored. For example, using a visual aid for iPad can increase the contact time of presenting details to the target consumer from less than a minute to 3.5 minutes. Companies are using much of the technology at their disposal to good effect, developing online detail aids and apps. Increasingly, they are creating websites that include password-protected portals for physicians, while e-details are improving engagement. Patients and caregivers are adopting more proactive approaches, leading to better doctor-patient communications. Health information is becoming ever more specialised and there is an urgent need to fulfil this unmet requirement in Brazil. The use of digital channels in creating increased engagement, either with healthcare providers (HCP) in an educational setting or through disease awareness campaigns aimed at the public and patients, is a priority for pharma in Brazil. Specialists are more technology-focused and have been early adopters of iPads and electronic medical records, and the numbers of primary care providers adopting technology and e-health practice are growing quickly. More and more HCPs are going online to find information about clinical trials, diagnostic pathways and treatment algorithms, as well as drugs information. Prescription and OTC drug sales performance reflect Brazil's overall market trends, which result from the lack of reimbursement mechanisms and high reliance on out-of-pocket spending. Nevertheless, the burgeoning middle class will sustain consumer spending in the medium term, and it is likely that the prescription market will reach a value of around $29.64bn in 2015, up from $16.55bn in 2010, when it represented almost 79 per cent of the total market. Increasingly, more sophisticated medicines are likely to dominate the prescription drug market in value terms, along with more widely available bioequivalent generic medicines. In general, alimentary and metabolism products will remain the lead drug categories in the medium term, although a sustained increase in purchasing power and access to healthcare would see solid growth in central nervous system, cardiovascular and respiratory medicines. The potential for more expensive patented products remains high, given the country's underdeveloped R&D sector and its high reliance on imported innovative drugs. Sales of patented drugs could reaching a value of $21bn in 2015. The projected continuation of sales expansions is one of the key reasons that multinational research-based drugmakers continue to invest in Brazil. Written by AMK Healthcare Communications – McCann Health. Contacts: JD Puentes (left), President & CEO, AMK Healthcare Communications Latin America and John Cahill, CEO, McCann Health.